I'm finally back with another post! If you noticed that things were a bit quiet on here for the past week and a half, the reason is that I was away at another conference, which kept me extremely busy! My sister and I were both invited to attend a conference in Seoul, South Korea and I just got back this weekend. It was nice to return to some slightly warmer weather here in Ontario, since it was freezing in Seoul! I was planning on doing another travel post to share some of the food that I ate on my trip, but it turns out that I really didn't have any interesting meals while I was there. The only authentic Korean dish that I tried was a vegetarian bibambap (rice with lots of different vegetables and spicy Korean red pepper paste), which I shared on my Facebook page. If you're interested in seeing more, you can check out my sister Natalie's post about our trip on her blog Once Upon a Cutting Board. Since there wasn't a lot of vegetarian food readily available in Seoul, I was glad that I had brought some of my own snacks with me. 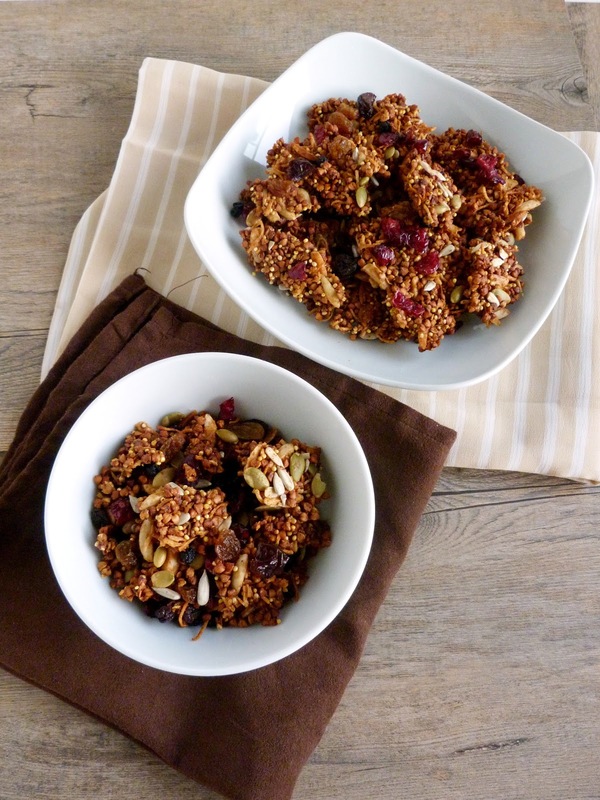 The day before I left, I made a batch of granola to bring along, and I liked it so much that I had to recreate it as soon as I got home so I could share the recipe with you! Ever since I tried this buckwheat snack from SaSha Co., I've been wanting to make my own version of a granola using toasted buckwheat (also called kasha). Kasha is a heart-healthy whole grain made by toasting raw buckwheat groats, and is a great option to use as a base for gluten-free granola instead of oats. I also added some uncooked millet to my granola, both for its nutrients and to add extra crunch! Along with the millet, I included slivered almonds, pumpkin seeds, sunflower seeds, dried cranberries, cherries and raisins as additional mix-ins. Everything got coated in a mixture of almond butter and agave syrup and baked in the oven in a single layer to help it clump together. After coming out of the oven, the kasha and millet took on an even stronger toasted, nutty flavour that I loved. 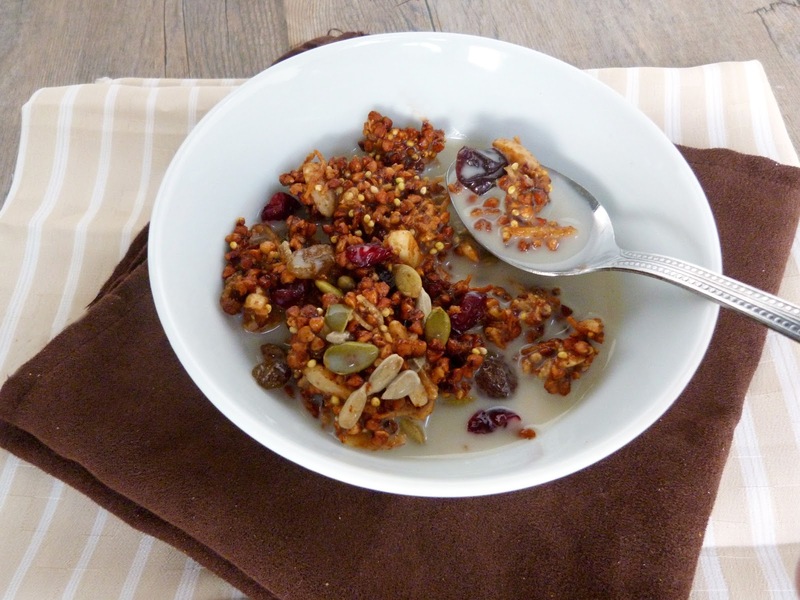 This is an extremely crunchy granola, so it's perfect for adding to milk or yogurt without getting mushy - this is actually the first cereal that I've been able to enjoy in a bowl with almond milk in a long time - it survived a photo shoot and was still perfectly crunchy by the time I was able to eat it afterwards! I also liked that it wasn't too sweet, so it made a good snack for munching on its own too, which I did throughout my long journey to and from Korea! In a large bowl, mix together the toasted buckwheat, millet, coconut, almonds, cinnamon, ginger, and salt. If your almond butter is on the thick/harder side, microwave it on medium power for 15-30 seconds, until it is thin and pourable. Add the agave and vanilla to the almond butter and whisk to mix together. Pour the mixture over the dry ingredients and stir with a rubber spatula until the dry ingredients are evenly coated. Spread mixture onto a foil-lined baking sheet. Press down with a rubber spatula to form a large rectangle that holds together. Place in the preheated oven for 10 minutes. Remove and add the pepitas and sunflower seeds. Flip the mixture with a spatula and press together again to form a rectangle. Return to the oven for 10 more minutes. Remove from oven and sprinkle the dried fruit and raisins over the mixture, then press them down with a spatula. Let cool completely on the baking sheet without stirring. Once cool, break granola up into pieces. Store in a bag or airtight container. Love this recipe! I especially like how little sweetener there is in it. I'll definitely be making this! Thanks! I've become more and more sensitive to sugar levels in boxed cereal and granola, so I like being able to control the amount myself! It's always a little letdown when you're traveling and can barely sample any of the local cuisine because so much of it isn't vegetarian! I never think to take my own snacks, but it sounds like it's a good thing you did--this is the perfect thing to bring along with you! Yeah, most of the menus that I saw there had very limited options for a vegetarian...although to be fair, I never ventured out of our district, so maybe I could have found some good street food somewhere else in Seoul! I always travel with lots of extra granola bars just in case! Delicious! This is exactly what I need when I travel. I get shaky between meals if I'm not careful. This would be great to have on hand to ensure I don't get shaky between meals. Love all the grains, seeds and dried fruit. I noticed I was a bit shaky sometimes during our conference days before lunch, but I wasn't sure if it was lack of food or too much coffee (because I drank more than usual while I was there to keep me awake!). Always a good idea to have emergency snacks with you! I wish you'd made a batch for me too! This was so good and I loved how crunchy it was! 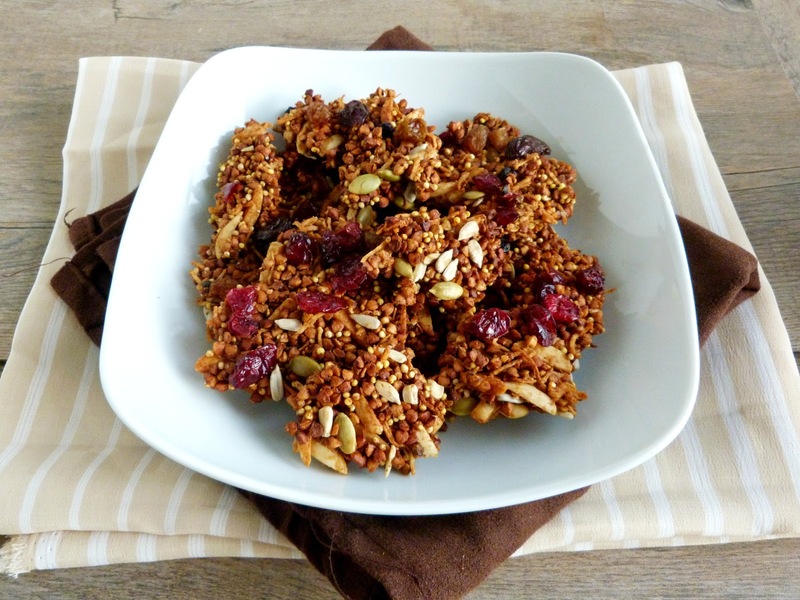 I have been hooked on granola lately and this looks like a great one to try next! Thanks - hope you like it if you give it a try! It's a different type of granola than the ones I'm used to, but that's what I like about it! YUM! This reminds me of a raw granola that I was addicted to *Maybe Emily's? I can't remember, I am ABSOLUTELY Making this version soon - ugh I am totally craving a bowl of this right now! I made this for my son when he was on a gluten-free cleansing diet. It was so good that we continue to make it for him even though he can eat gluten again.